Stoicism is usually associated with enduring the world as it is rather than changing it. Nevertheless, a stoic attitude to life is primarily an active attitude, with the aim of ‘living well’. The Stoics were far ahead of their time with their ideas about equality between people, cosmopolitanism and the denial of the existence of conflicts of interest. 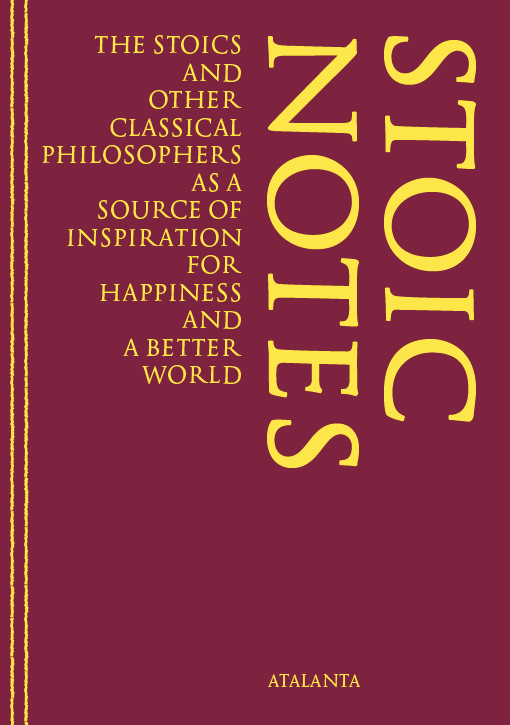 These and other ideas from Stoic ethics are both challenging and supportive, not only for striving for personal happiness but also for improving the world, in other words improving relationships between people. We can therefore obtain inspiration from the Early Stoa in at least two ways: by learning to deal ‘stoically’ with setbacks, and by finding out about what Stoics mean by a good life. Rymke Wiersma (Middelburg 1954) studied philosophy in Utrecht for a few years after being trained as a social worker. Together with a small collective she established a printing house, which later became the publishing house Atalanta. Its target audience are ‘thinkers’ as wel as ‘doers’. Rymke writes: “A lot of people who want to change the world go about it rather impulsively, while the people who delve into philosohpy often forget the we are not solely spectators, but also actors on the world’s stage. Atalanta tries to reach both these groups of people with it publications. Such useful research and helpful comments, thank you very much, and thank you John for the conversion. That’s great! Thanks a lot! Where may I get the physical book? The Atalanta Website doesn’t work. Here you have the pdf, there is no physical book in english but we try to make an epub. This is wonderful. My gratitude to you for posting it. Thank you also for the free access to this wealth of knowledge, it is very much appreciated. Many thanks for this wonderful gift. The material seems brilliant! Is there a way to transform it to a format where one page in the file corresponds to one page in the book? – that way, I can put it in my Kindle and read it. Otherwise, the print is too small. What a gift! Thank you very much. It’s great to have this book available free, but why limit it to PDF format? I’d love to have it as an epub, if that is possible, since this makes the book a lot easier to read on mobile devices. If the raw text were made available, I would be happy to produce an epub for the benefit of all. We would love to publish it as an epub book, but never have done it, and our Indesign version is too old to make epub files. The problem is in the styles in the layout, so a ‘raw text’ is very raw indeed. Much is lost. I’ll try to find a way around the problems. Where can I purchase the actual book?